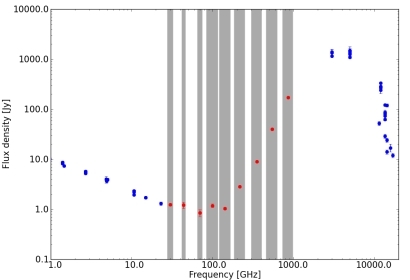 This graph shows the Spectral Energy Distribution (SED) of M82, a nearby infrared-luminous, starburst galaxy, as measured by Planck (red dots) and previous observations (blue dots). The SED of M82 exhibits the characteristic bump at sub-millimetre/far-infrared wavelengths (corresponding to high frequencies, on the right-hand side of the graph) that is typical of starburst galaxies, highlighting the intense star formation processes taking place within these objects; at longer radio wavelengths (corresponding to lower frequencies, on the left-hand side of the graph) the SED becomes a power-law, but much weaker with respect to that of a radio galaxy. The new data points gathered by Planck fit extremely well in the overall shape of the SED, demonstrating Planck's ability to achieve robust measurements across the entire sky, spanning a very broad range of frequencies. M82, a prototype starburst galaxy, is one of the thousands of extragalactic sources listed in the Early Release Compact Source Catalogue (ERCSC), the first scientific product from the Planck Collaboration to be made publicly available. 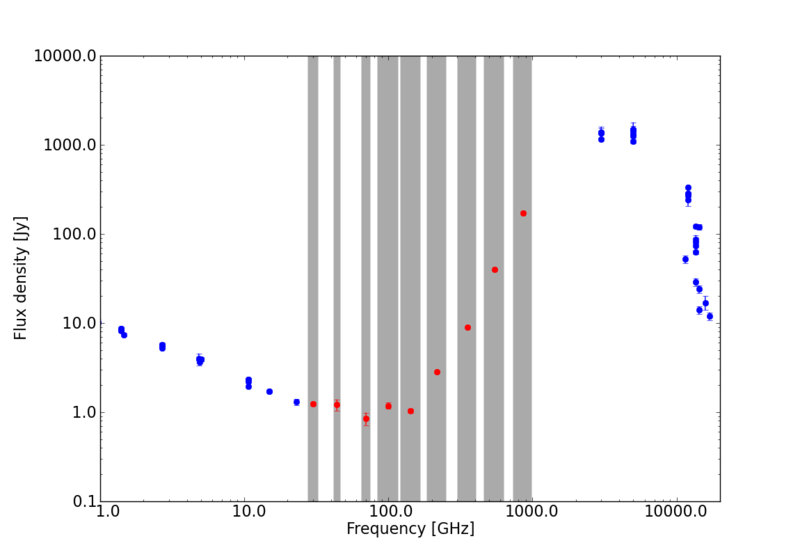 The data points at frequencies below 30 GHz correspond to observations performed with the following facilities: the interferometer at the Mullard Radio Astronomy Observatory (MRAO) in Cambridge, UK (with baselines of 5 km and 790 m, respectively ); the 43-m Telescope, the 91-m Robert C. Byrd Telescope and the now decommissioned 65-m transit telescope of the National Radio Astronomy Observatory (NRAO) in Green Bank, West Virginia, USA; the 100-m radio telescope of the Max-Planck Institute for Radio Astronomy, located in Effelsberg near Bonn, Germany; the now dismissed Texas Interferometer of the University of Texas Radio Astronomy Observatory (with a baseline of 275 m); the 76-m MKIA Radio Telescope, now renamed the Lovell Radio Telescope, at the Jodrell Bank Centre for Astrophysics in the UK; the Very Large Array (VLA) of the NRAO located in Socorro, New Mexico, USA; and the Wilkinson Microwave Anisotropy Probe (WMAP). The data points at frequencies above 1000 GHz correspond to observations performed with the IRAS and ISO infrared space telescopes, as well as with the 2.3-m Bok Telescope on Kitt Peak and the NASA 61-inch telescope on Mount Bigelow, the latter now referred to as the Kuiper 61-inch Telescope, both located in Arizona, USA and operated by the Steward Observatory of the University of Arizona.